Subject to special return restrictions. 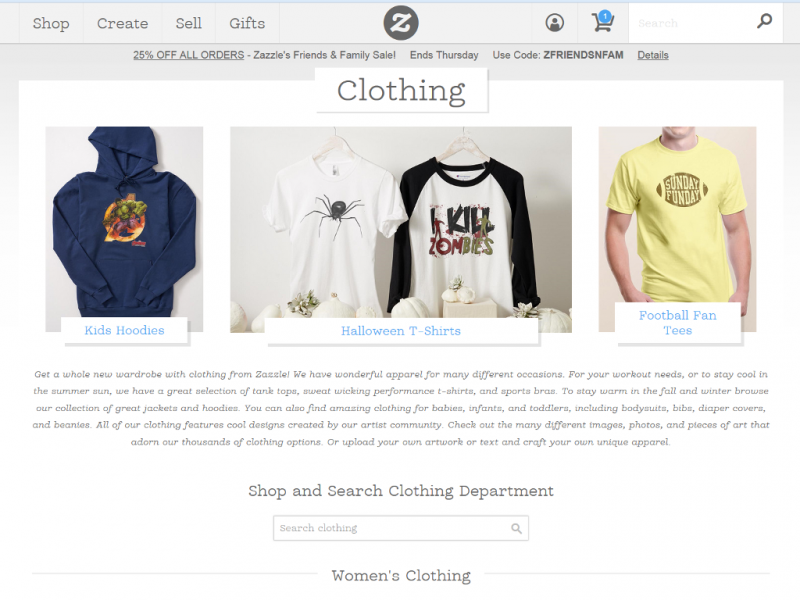 Zazzle was launched in 2003 and is based in Redwood City, California. They are one of the leading platforms for the creation of quality custom products with more than 30 million shoppers worldwide. 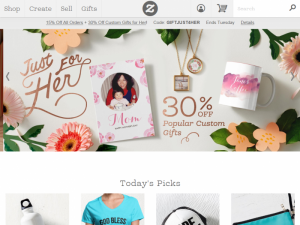 Zazzle's product base covers a large assortment of items including business cards, clothing, invitations, phone cases, pet gifts, and holiday related gifts, just to name a few. They also have partnered with leading companies like Disney and Hallmark which means you can personalize the brands these companies own to your tastes. Zazzle also holds thousands of official images from your favorite music bands and entertainment artists which they have made available for you to customize on t-shirt, posters, mugs, postage stamps and more. Zazzle is an on-demand manufacture and is one of the most versatile printing services we have found. Products are either created directly by Zazzle or by one of their partner manufacturers with most orders often being created in under 24 hours. Artwork found on the products are created by Zazzle, or one of their partnered designers (artists, graphic designers, and photographers), or even by you (when you use the custom creation tools). Most products include a customize option which allows you to personalize the design on your item by adding your own art, photos and text. T-Shirts, Hats, Hoodies, Jackets, Undergarments, etc. Bags, Buttons, Keychains, Watches, Luggage Tags, etc. Mugs, Pillows, Stickers, Magnets, Chocolates, Ornaments, Plates, etc. Dog Beds, Pet Bowls, Leashes, Collars, etc. Phone Cases, iPad Cases, Laptop Sleeves, Speakers, USB Drives, etc. Posters, Photo Prints, Wood Wall Art, etc. Invitations, Thank-you Cards, Bridesmaid Gifts, Groomsmen Gifts, etc. Holidays, Baby Shower, Birthday, Paper Plates, Cups, Napkins, Cake, Cookies, etc. Gift Bags, Ribbon, Tags, Labels, etc. Business Cars, Calendars, Clipboards, Name Plates, etc. Fabric, Wrapping Paper, Stickers, etc. Cookies, Chocolate, Cake, Gum, Chocolate Bars, etc. Once you have found the product you are looking for you are presented with page that includes the product description along with any specifications you can modify. This includes things like sizes, color, and quantity. Most items also include a "Customize it!" button which allows you to add and/or edit the artwork found on the product. This means you can add/remove/resize images and text, and move items around. There is no minimum order so once you have finalized your custom product you can go ahead and add it to the cart and then order it. All major credit cards are accepted along with PayPal. One excellent feature of the shop is the customer reviews. Verified shoppers can leave reviews of items they bought which are listed at the bottom of every product page. Each review has a 5 star rating and a description about the product and the print. The reviewer also grades the product quality and the print quality on a scale (from bad to excellent). Reviewers can let other shoppers know if the item was shipped on time and most importantly if they recommend it. Zazzle offers a 100% satisfaction guarantee on most products. If you are not completely satisfied you can return your purchase for a replacement or refund within 30 days of receipt. Please visit Zazzle for more information on returns as some items are subject to special restrictions. Zazzle offers 3 easy shipping options for orders shipped within the US. You can choose from Express, Premium and Standard shipping services. If you need your order ASAP, Express shipping will deliver it to you in 1 business days from the date of shipment (after manufacturing). You need to allow 2-3 business days for Zazzle's Premium Shipping, and 4-7 business days for Standard. Available shipping options will vary depending on the product type, quantity ordered, and address type. Manufacturing and processing (turnaround )times vary depending on the product but on a large number of products are completed in 24 hours. Zazzle ships to most international locations, which includes over 100 countries. International orders may take up to 6 - 13 business days for delivery (1 business day process + 5-12 business days in transit). If you like you can create your product completely from scratch. Just visit the Create part of the website and you will be shown pretty much the same list of products available as listed above. You then select the product you want and you then can go ahead and completely customize the art of the product. Depending on the item you will also be able to specify different styles (for example with clothes), sizes, and colors. Upon creation, products are instantly and accurately visualized on the site and offered in the Zazzle marketplace for others to purchase (if you wish). The Sell portion of the Zazzle service allows Designers to upload their artwork and earn royalties when their work is used by shoppers on any of the hundreds of products available on Zazzle. 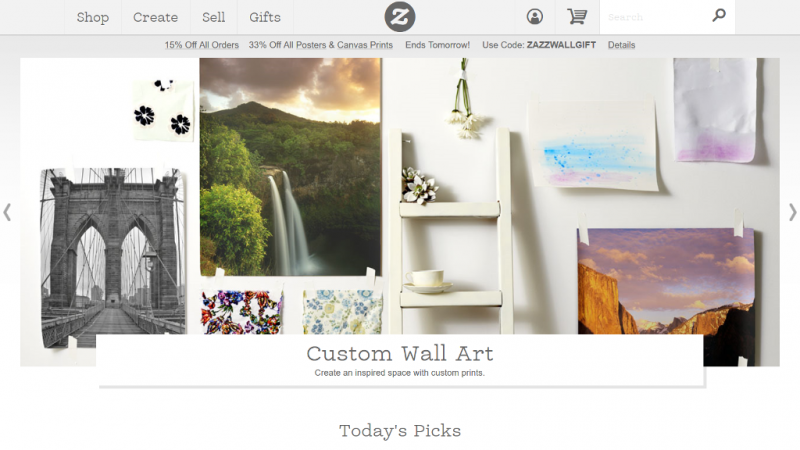 Ideal Zazzle Designers are freelance Artists, Graphic Designers & Photographers. Makers (Manufacturers) can also have there made-to-order products listed for sale on Zazzle if they meet certain conditions. 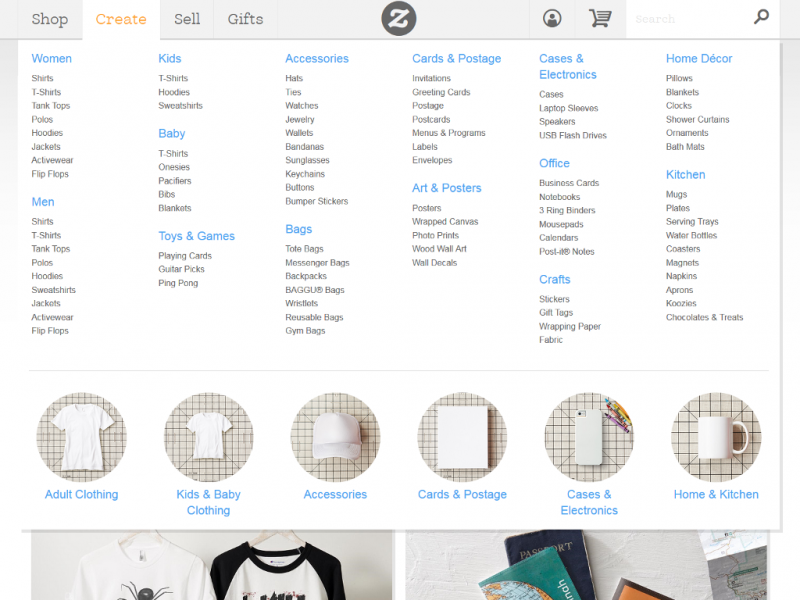 For Makers, Zazzle has custom tools for managing orders and customizing your product. Zazzle is an incredible website with almost an infinite number of product and artwork combinations. If you are looking for customized gifts, clothing (baby, kids, and adults), pet gear, invitations and cards, then this is the ideal service. Zazzle has decent pricing but they shine most with the sheer selection of products and the amount of artwork you can select and modify to put on your product. For Businesses Zazzle will more than suite your needs if you are looking for that customized gift with your business name and logo. For paper marketing materials (labels, brochures, posters, business cards, etc.) we recommend trying a more specialized online print service (like the others listed in this category) since the pricing is better with volume orders. Plus you get more options with stock choices, sizes, and folding options (just to name a few). Many products and artwork to choose from. Create your own custom product. Some have reported problems with returns. Can't even handle a single delivery. Reported "Lost in transit" after wait for more than 3 weeks. They can't even handle a simple delivery right. Yeah, lots of great designs by artists. What is the use of it if you can't have it. Ordered a long sleeve top on 30/11/17, I have to wait until 19/12/17 for the customer support to take action!! It's too late for them to post another one, they have ruined my Xmas present. They claimed they have a tracker ID but there is no link to look it up. Their business logic is completely lack of common sense. Other companies can do much better even before the birth of internet. STAY OUT OF XMAS PRESENT WITH THEM OR ORDER A YEAR BEFORE!!! I ordered from Zazzle for the first time last month. I ordered several items that were customized for my wedding anniversary. The ornament and frames are high quality and the engravings looked nice and are very detailed. I give high marks for Zazzles products but their shipping was late. Costs seemed a little expensive but after seeing the quality it is worth it. My shipment date changed to a week later due to delays in processing. I still got my presents for my wife in time for our wedding anniversary but just barely. I was annoyed that I got no notification about the change in delivery. Other than that I would recommend them, just give yourself plenty of time for delivery in case your order is late. Ornament was pretty and of good quality. Our names and wedding date engraving came out beautifully. I've ordered t-shirts twice from Zazzle.com without any problems. Both of my orders shipped within a few days of me placing them and the shirts came exactly as I designed them. The shirts are of good quality and the printing has held up really well to washes. One of the shirts was ordered a year and a half ago and it still looks almost brand new. I did have one question with my first order. I spent almost 30 minutes waiting on hold for customer service. The rep answered my question and all was fine but the wait should have been shorter. This was my first order and everything went fine. I will be ordering again from Zazzle. I ordered some business cards and a personalized case for my iPhone. The business cards where pretty intricate but they look perfect and the paper quality is good. I only ordered 50 as a sort of test run but I will order many more next time so I get a better deal. The iPhone case is really nice. It has my company name and logo on the back of the leather fold case. Looks really nice. If I can I will upload a picture of it. I received my order the following week without problems. I am not sure how customer service is as I never contacted them. Site was straight forward and easy to use. Designed my business card wasn't bad with the built in tools. I was able to use the font I wanted and was able to size and arrange the text and graphics to suit my needs. I had a high quality image of my logo and uploaded it to Zazzle and was able to incorporate it into my business cards and my iPhone case.